The foreigner has vast reserves of tradition and historic consciousness which root back in all parts of Europe, and which might be made to supply a background we very much lack in American cities. 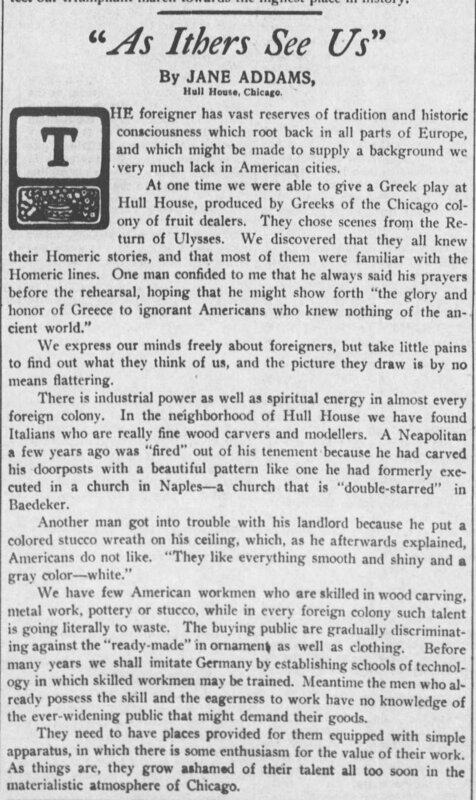 At one time we were able to give a Greek play at Hull House, produced by Greeks of the Chicago colony of fruit dealers. They chose scenes from the Return of Ulysses. 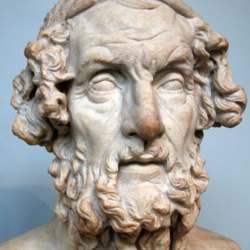 We discovered that they all knew their Homeric stories, and that most of them were familiar with the Homeric lines. One man confided to me that he always said his prayers before the rehearsal, hoping that he might show forth "the glory and honor of Greece to ignorant Americans who knew nothing of the ancient world." We express our minds freely about foreigners, but take little pains to find out what they think of us, and the picture they draw is by no means flattering. There is industrial power as well as spiritual energy in almost every foreign colony. 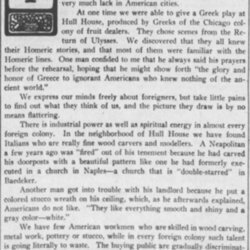 In the neighborhood of Hull House we have found Italians who are really fine wood carvers and [modelers]. A Neapolitan a few years ago was "fired" out of his tenement because he had carved his doorposts with a beautiful pattern like the one he had formerly executed in a church in Naples -- a church that is "double-starred" in Baedeker. Another man got into trouble with his landlord because he put a colored stucco wreath on his ceiling, which, as he afterwards explained, Americans do not like. "They like everything smooth and shiny and a grey color -- white." We have few American workmen who are skilled in wood carving, metal work, pottery or stucco, while in every foreign colony such talent is going literally to waste. The buying public are gradually discriminating against the "ready-made" in ornament as well as clothing. Before many years we shall imitate Germany by establishing schools of technology in which skilled workmen may be trained. Meantime the men who already possess the skill and the eagerness to work have no knowledge of the ever-widening public that might demand their goods. They need to have places provided for them equipped with simple apparatus, in which there is some enthusiasm for the value of their work. As things are, they grow ashamed of their talent all too soon in the materialistic atmosphere of Chicago. Excerpts from Addams' speech on educational opportunities wasted due to discrimination against immigrants. Jane Addams "As Ithers See Us", Parsons Daily Sun, July 15, 1903, p. 2. This article appeared in several newspapers. The title comes from Robert Burns' poem, "To A Louse On Seeing One On A Lady's Bonnet, At Church," 1786. 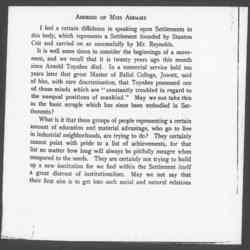 Addams, Jane, “As Ithers See Us, July 15, 1903 (excerpts),” Jane Addams Digital Edition, accessed April 22, 2019, https://digital.janeaddams.ramapo.edu/items/show/6725.